Jay Leno is probably the most famous car nut in the world. Along with that, he dedicates a ton of his time to entertaining the troops. Recently, he spent some time Cpl. Ethan Laberge, a wounded vet and car nut. And after he took him for a ride in a new Challenger Hellcat, he gave it to the soldier. The feels. 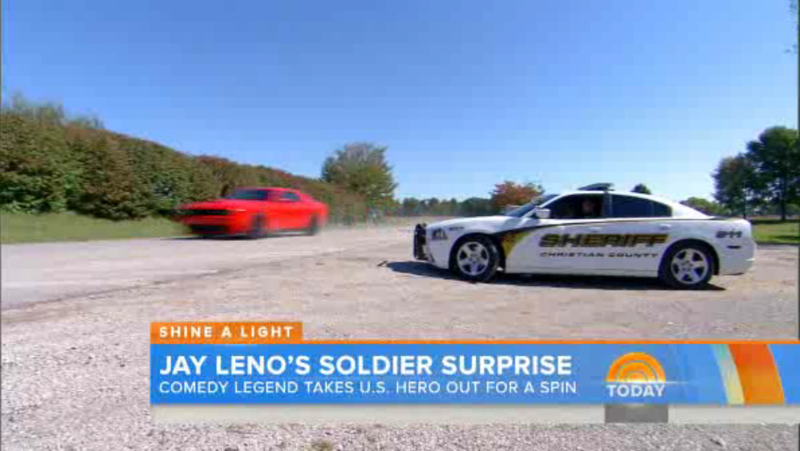 For a segment on The Today Show, the former Tonight Show host spent some time with Cpl. Laberge, who was wounded when a suicide bomber drove up to him in Afghanistan and detonated himself. The blast seriously wounded Laberge and killed his two colleagues. Now recovering from his wounds, Laberge and Leno went for a ride in the Hellcat and talked cars. At the end, Laberge said he'd love to have a Hellcat, and that's when Leno handed him the keys and told him not to get many tickets. That's kind of awesome. Sorry if you're weeping at your desk now. It's awfully dusty in here.